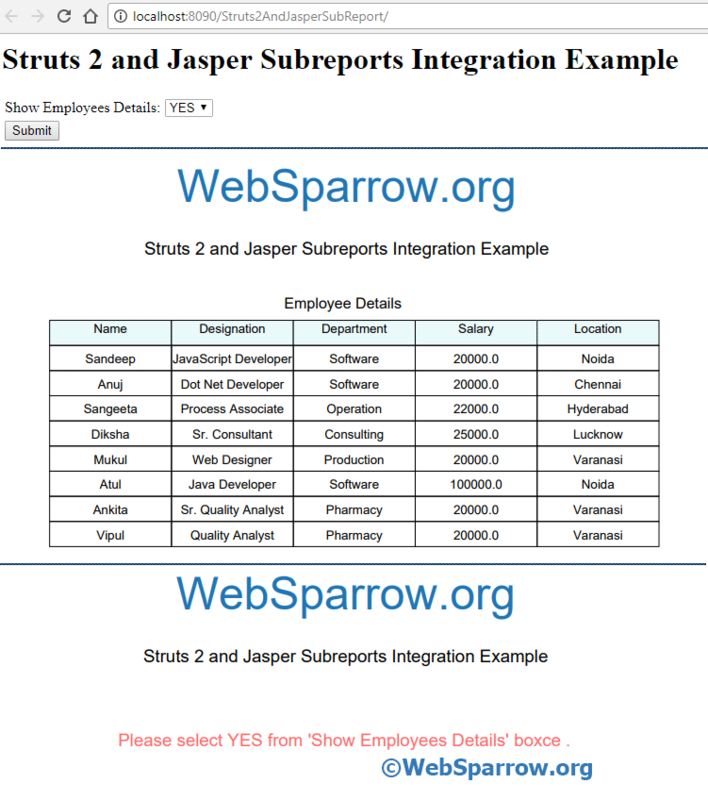 This example shows you how to integrate the Jasper Subreports with Struts 2 application to generate the dynamic reports. Jasper Subreport functionality helps to manage the large report in an easy way by dividing into subreports. Initialize the HashMap<String, Object> and put the all the parameters details. Compile the master report and fill the report by calling JasperFillManager.fillReport(JasperReport jasperReport, Map<String, Object> parameters, JRDataSource dataSource). Pass the empty datasource to the master report. Export the report by calling JasperExportManager.exportReportToPdfFile(JasperPrint jasperPrint, String destFileName). Note: You can send as many ResultSets as you want in the parameters map but make sure to declare the parameters in the report with the same names and set the parameter class as net.sf.jasperreports.engine.JRResultSetDataSource. To work with Struts 2 and JasperReport, you must have included the core JAR. To resolve the JAR dependency, you add the following dependency on your pom.xml. Have a look of project structure in Eclipse IDE. Create the EMP_DETAILS table and inserts some values using MySQL database. Find the table script. To design your report you can use the iReports tool. You need to design the two separate reports first is master reports and second is subreport and link the subreport into the master reports. Find the jrxml of both reports. In the subreport fields, names must be the same as stored in ResultSet. 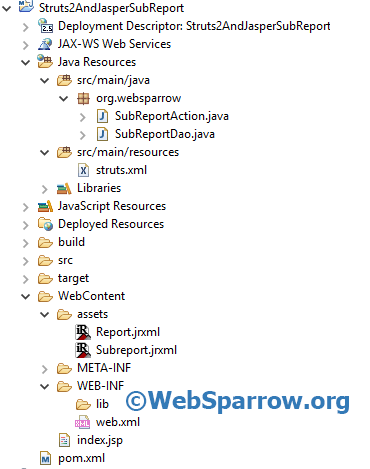 Define the Struts 2 filter in web.xml file. Create the Data Access Object class to fetch the employee details from the table. Inside the Action class initialize the HashMap<String, Object> and put the subreport and data source of subreport in the form of ResultSet. Create the JSP page for the user interface. Finally, map the action class inside the struts.xml and set the result type= stream . Now everything is all set. Deploy the project inside the Tomcat » webapps folder and start the server. If we select YES from then it will include the subreport in the main report and display all employees details and if we select NO then it will not include the employee’s details in the main report. See the below screenshot for more details.